I have a secret to share, but I really don’t want to accept, admit or share my secret. My now four and six year old children’s bedrooms and closets are a disaster on a day-to-day basis. The mess was containable and controllable when they were younger, but now it gets a little out of hand. Shhhh… don’t tell. The “toy organization lady” (as I am appropriately dubbed in my home town of Vienna) doesn’t always have an organized house. Lucky for you, I took pictures of my children’s rooms on “clean-up day”- one of my favorite days that only happens every week or so. You can actually see the furniture, floor and shelves in the pictures. Don’t kid yourself- my children’s rooms don’t always look this neat and tidy, but nor should they. 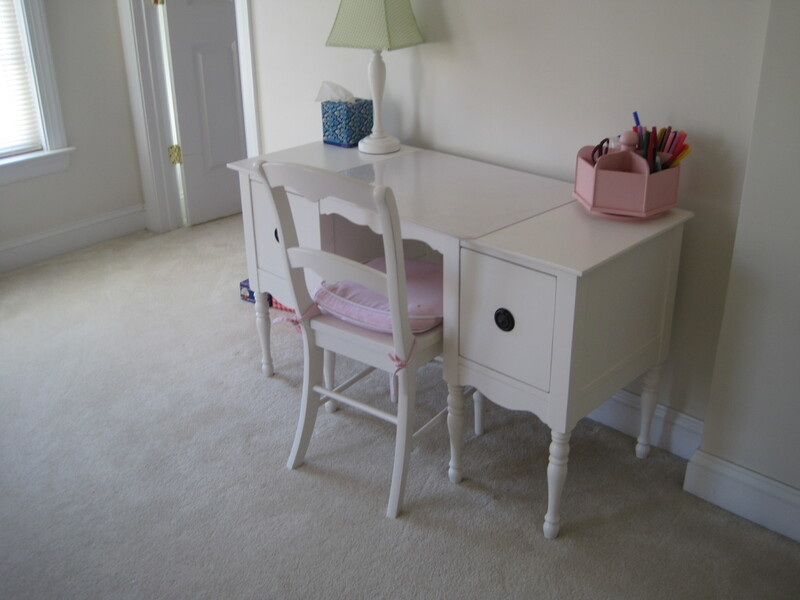 When it comes to kids, a clean room is an unused room. Toys should have a home and organization is a worthy goal to strive for, but if it becomes the highest priority it can hinder free-play and learning. Make an organization plan, do your best and let go of the rest. But, how big of a mess is TOO big? When should parents draw the line? The answer lies in both you and your child’s temperament, your child’s age & stage and the time you have to devote to cleaning and organization. It is a balancing act. If you like your home tidy, your child is amendable to cleaning and you have time to devote to the task, then, by all means, make clean-up time a priority. The good news is that kids practice academic skills, develop grit and learn how to be a team-player during clean-up time. But, if you are anything like my family (both parents like a tidy home, the kids loathe cleanliness and we have just a bit of time to devote to cleaning) then take a deep breath, accept that family life is an imperfect life and set reasonable goals. My ideal is to clean up everyone’s room, the workspace and playroom twice a week, but realistically it is about one time a week. 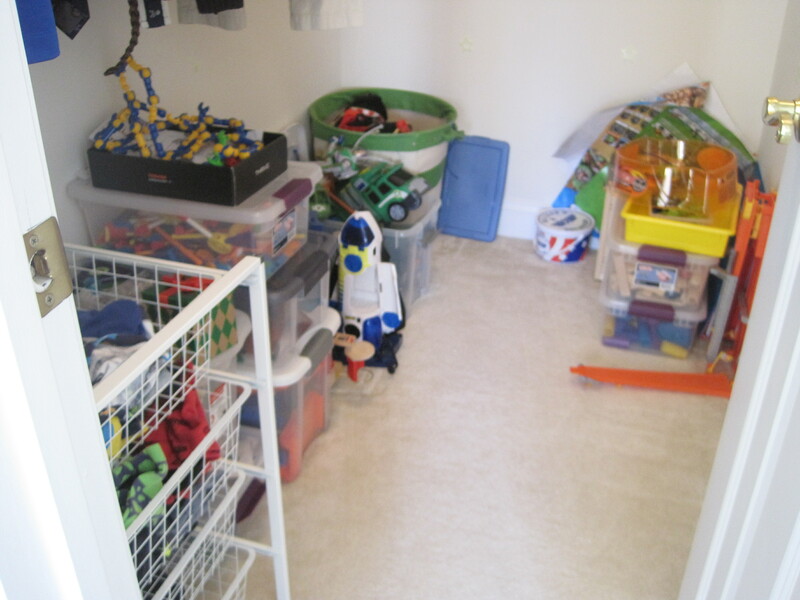 Now that we have realistic goals in mind, let’s take a quick tour of my children’s clean rooms to get some organizational ideas to make clean-up time a little less of a nightmare. Lucille’s Desk: Art supplies are stored in an organizer, fresh paper is stored in one drawer & old art projects are stored in another. 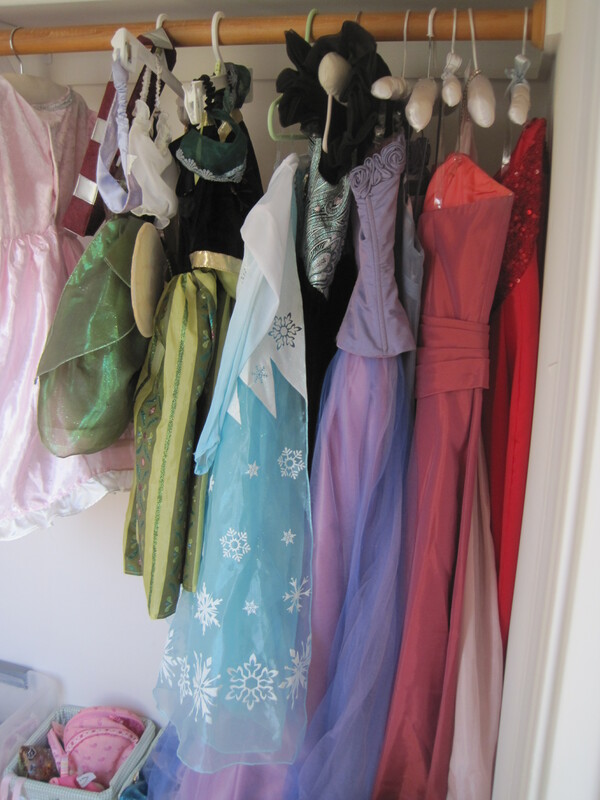 Lucille’s Closet: Dress-up clothes are best stored on hangers as their placement in large bins tends to leave them unseen and unused (yes, half of those are my old ball gowns modified for kids use). Lucille’s Closet: Large accessible shelf for books, bin for saxoflute, bin for gears, tool box, bin for Mr. Potato Head, two small bins with random toys. Ideally, bins would not be stacked, but alas reality would have it otherwise. 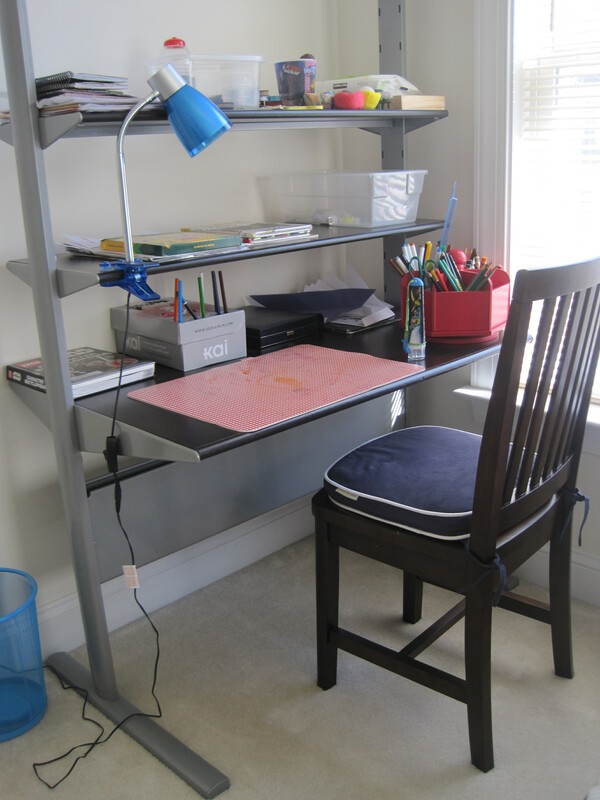 Jack’s Desk: A desk without drawers will have more mess, but using bins and storage containers helps. We use a placement to mark his workspace to keep items from encroaching. Jack converted a shoe box into a colored pencil holder- very handy! Jack’s Closet: We need shelves!! Until a family trip to IKEA happens, we use the similar-sized, clear tupperware containers to stack up sets of toys. There is a large bin for dress-up and a few odd sized toys stored against the wall. 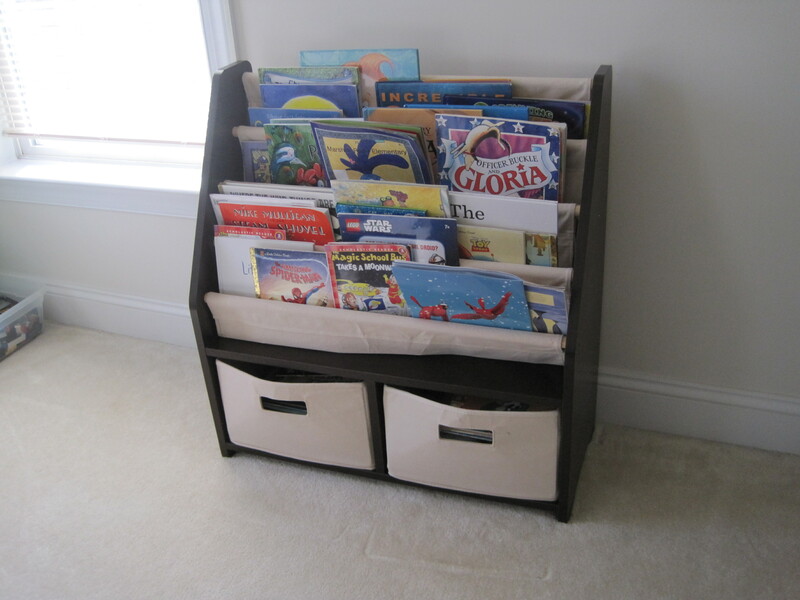 Jack’s Books: Books are stored and rotated using the drawers below the display area.